250 years in the future, all will be lost unless the fifth element is found. New York cab driver Korben Dallas didn't mean to be a hero, but he just picked up the kind of fare that only comes along every five thousand years: A perfect beauty, a perfect being, a perfect weapon. Now, together, they must save the world. Bruce Willis, Milla Jovovich, and Gary Oldman star in acclaimed director Luc Besson's outrageous sci-fi adventure, an extravagantly styled tale of good against evil set in an unbelievable twenty-third century world. $17.031 million on 2500 screens. Since this “Deluxe Edition” of The Fifth Element represents my third review of the film, I’ll skip my discussion of the flick. If you’d like to check out my full appraisal of it, please click here to check out my thoughts. To summarize, I found very little to dislike about The Fifth Element. Director Luc Besson packed the screen with so many fascinating visual elements and other bits that I always find something new when I watch it. Each subsequent viewing gives me another great moment onto which I can latch. The Fifth Element teemed with such pieces, and it offered a truly fun and entertaining flick that I think will continue to look good for years to come. 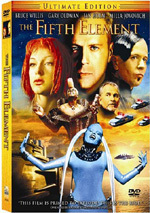 The Fifth Element appears in an aspect ratio of approximately 2.35:1 on this single-sided, double-layered DVD; the image has been enhanced for 16X9 televisions. As I noted earlier, this was my third look at Leon. 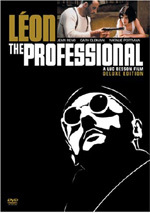 For all intents and purposes, the picture and audio of the Deluxe Edition acted as a reprise of the Superbit version. This set represents the third DVD release of Element. The original came out in 1997, back when the format hadn’t even celebrated its first birthday. It crammed both fullscreen and widescreen versions of the movie onto one double-sided disc, but somehow it still managed to offer very satisfying picture and sound. The Superbit version hit the shelves about four years later. I thought both the Superbit and this release provided a more solid viewing experience compared to the original disc, but not by a tremendous amount. Sharpness looked excellent throughout the film. At no time did I discern any sign of softness or fuzziness. The image remained crisp and distinct at all times. I noticed no jagged edges or moiré effects, but I did witness a smidgen of edge enhancement in a few shots. Print flaws remained consistently insignificant. The movie showed a few speckles and a little grit, and it also displayed one or two streaks and scratches. Nonetheless, the majority of the film seemed clean and fresh. Colors offered a highlight of Element. The movie featured a wonderfully broad and varied palette, and the hues consistently seemed vibrant and lively. I’d like to recommend a particular section, but the whole movie was a delight in that regard; colors always came across as truly dazzling. Black levels appeared to be deep and rich, and shadow detail seemed clear with appropriate density; low-light situations demonstrated good definition. The entire image seemed three-dimensional across the board. It was a smooth appearance that approached the ever-elusive ideal of a “film-like” presentation. I was reluctant to give it a straight “A” due to the source flaws, but the rest of it looked so amazing that I thought the image deserved the grade. Were it not for some of the niggling flaws that carried over from the old one – since this appeared to be the same transfer – the Superbit Element would have earned an “A+”, whereas I never felt that strongly about the 1997 release. 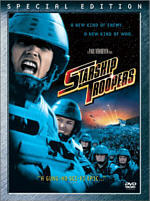 As befit a big action/sci-fi flick such as this, the Dolby Digital 5.1 and DTS 5.1 soundfields provided an extremely active and engaging setting. All five channels received a solid workout, but the track never seemed to offer any gratuitous audio; the various elements existed to create a vivid and engrossing whole. Music showed fine stereo separation across the front speakers and also cropped up with good support from the rear. Effects really made the mix work, however. All of these elements came from appropriate locations in the soundfield, and they blended together very nicely. Sounds moved cleanly across speakers as they created a very believable environment. This included the surrounds, which actively supported the forward spectrum. A tremendous amount of unique audio came from the rears, and it all meshed together neatly. Overall, this was a well-made soundfield that offered a fine listening experience. For the most part, audio quality seemed to be strong, but a few lapses occurred. Although much of the dialogue needed to be looped, it usually sounded natural and distinct. No problems with intelligibility occurred, but some edginess interfered at times, particularly during the battle scenes on Fhloston’s Paradise. Those segments caused the most concerns across the board, as they consistently displayed some minor distortion for the effects as well. A little additional roughness could be heard a few times during the rest of the film, but this remained acceptably modest and didn’t significantly interfere with the audio. The track presented some nicely bright and dynamic music. The score seemed to be well reproduced, as the mix made it sound clear and vibrant at all times. Bass response appeared very solid across the board. Not only did the music sound rich and full, but also the effects displayed excellent low-end when appropriate. Some of this movie will really shake the walls, and the bass always remained tight and concise. All in all, The Fifth Element provided a fine soundtrack that got downgraded to an “A-“ due simply to some minor distortion. The comments above duplicated what I wrote in my review of the original DVD, as the two sounded identical to me. All of the same highs and lows appeared, and that included the minor distortion; those elements seemed to be part of the source material, and no new DVD format or anything else will change that. I also heard virtually no differences between the Dolby Digital and DTS mixes. Sometimes DTS tracks offer stronger bass response or a greater transparency to their soundfields, but I detected no such variations. Both soundtracks seemed to be very strong, and they offered solid auditory experiences. The Fifth Element provided a great mix on the original DVD, and the Superbit version continued that high standard. While the prior DVDs included no extras, this new “Ultimate Edition” of The Fifth Element added a very good set of supplements. On DVD One, we get only one component: a fact track. This works in the standard subtitle commentary manner. Text runs at the bottom of the screen that covers topics like the cast, sets, production elements and notes from the shoot. In the category of “annoying punctuation”, the track uses way too many exclamation points. It also suffers from a lot of dead spots. A similar piece that accompanies the Leon Deluxe Edition runs text without many pauses, but unfortunately the same can’t be said for Element. We get quite a few nice tidbits here, but it’s not as strong as its mate. This leaves the bulk of the supplements over on DVD Two. First up is an area called The Visual Element. It starts with a featurette that goes for 18 minutes and 23 seconds. This offers movie clips, behind the scenes snippets, and interviews. We hear from designers Jean Claude Mezieres, Jean “Moebius” Giraud, and Patrice Garcia. The program looks at the history behind its two designers and their recruitment for the movie, visual influences and concepts, the film’s development, and the look of some specific pieces. I like the parts that look at Mezieres and Giraud, as those aspects give us a nice feel for the background that influenced the movie. The other bits expand on various topics as well and help make this featurette useful. In addition, “The Visual Element” presents a series of tests. These cover “Pyramid” (40 seconds), “Cornelius’ Apartment” (0:29), “Zorg’s Office” (0:28), “Airport” (2:18), “Fhloston Lobby” (1:19), “Fhloston Corridor” (0:17), and “Fhloston Bedroom” (0:33). These silent clips shoot the sets in basic ways to give us a look at them. Under The Digital Element, we locate a nine-minute and 46-second featurette. It presents notes from visual effects supervisor Mark Stetson, supervising director of photography for visual effects Bill Neil, visual effects art director Ira Gilford, lead digital compositing supervisor Jon Egstad and miniature effects supervisor Niels Nielsen. This program focuses mainly on the ways they used computer effects, miniatures and other techniques to create a futuristic New York. It provides a terrific set of behind the scenes footage to illustrate the concepts and it gives us a great look at how they executed the scenes. As we head to The Star Element, we get three separate featurettes, each one dedicated to an actor. These include “Bruce Willis” (four minutes, 17 seconds), “Milla Jovovich” (12:45), and “Chris Tucker” (4:16). These present remarks from Willis, Jovovich, and Tucker, each of whom acts as the only participant in the logical spot. The Tucker and Willis featurettes don’t offer much more than the standard promotional superficiality, though Tucker gives us a decent glimpse of his inspirations. However, Jovovich’s piece gets into things with greater depth. She covers her casting, developing the character, and various challenges. It’s a good discussion. The “Jovovich” section also includes some “Extras”. These present four different screen tests that run between 69 seconds and five minutes, 53 seconds for a total of 11 minutes and 57 seconds. The silent clips show various visual possibilities for Leeloo’s look and are intriguing to see. Split into four subdomains, The Alien Element covers various species. “Monoshawans” gives us an eight-minute and 11-second featurette with comments from creature effects supervisor Nick Dudman, key animatronic model designer Monique Brown, and key animatronic model designer Chris Barton. The show covers the challenges created by the Mondoshawans and delves into their development and construction. It goes through the subjects in a concise manner that provides a tight look at the appropriate aspects of the production. ”Mondoshawans” also includes three screen tests that fill a total of 127 seconds plus two “Battle Outtakes” that go 70 seconds in all. All five add up to give us some nice glimpses of the development of these aliens. “Mangalores” tosses out three components. The featurette runs nine minutes and 45 seconds as it includes info from Dudman, Barton, and senior animatronic model designer Gary Pollard. The subjects found here are similar to those in the “Mondoshawans” piece, as we look at designing and creating the beings. It works just as well and is quite illuminating. In addition, “Mangalores” presents a 46-second “Head Test” and an 83-second “Battle Outtake”. The “Test” just shows uninhabited fake heads and is pretty dull. As for the “Outtake”, it offers a look at the Mangalores in their ship and also doesn’t add much. A four-minute and 15-second featurette discusses “Picasso”, Zorg’s pet. It presents statements from Dudman and Barton. It’s more of the same as the other featurettes, which makes it another tight and fun discussion. Finally, “Alien Element” ends with the components of “Strikers”. A three-minute and three-second featurette starts this area with notes from Dudman and Barton. If you don’t remember the “Strikers” from the movie, that’s because they never appeared; they were cut from the final flick. We learn about them and their design in this good little show. Four “Striker Tests” finish the domain. They run a total of 87 seconds. These offer interesting views of prototype puppets. When we head to The Fashion Element, we find another featurette. This one fills seven minutes and 45 seconds. We hear from costume designer Jean-Paul Gaultier as he discusses his work on the film. Gaultier goes into general issues related to the topic and offers specifics about his designs for various characters. He provides solid details and makes this a lively little piece. This section also tosses out some tests. We get one for Korben Dallas (58 seconds) and three for Leeloo (four minutes, 12 seconds total). These offer what you’d expect: shots of the actors in various outfits. All come from various sets, so they must have been shot during production. Next comes The Diva, which opens with a 16-minute and 13-second featurette. It includes remarks from actor Maiwenn as she chats about her casting, preparation for the role, dealing with the extensive makeup, shooting the flick, and her disappointment with the way her scene was edited. We also get to see the entire Diva performance in a version without final effects; we watch her sing in front of a greenscreen. Maiwenn’s notes offer nice insights, and the complete Diva sequence makes this featurette even more memorable. More about the Diva comes from a four-minute and 32-second “make-up test”. Another silent piece, this one puts actress Maiwennin different poses to work out the costume. Two “studio outtakes” go for a total of one minute, 51 seconds, and show the Diva on the opera house stage with a green screen backing. Finally, an “Opera House Outtake” lasts 94 seconds and shows a portion of her performance entirely from a rear angle. Inside the Poster Gallery, we get 25 ads from around the world. Finally, DVD Two offers some Previews. This area presents trailers for The Forgotten, Leon, and Mirrormask. After almost eight years and a bunch of screenings, I continue to find The Fifth Element to provide a funny, exciting and lively experience. The movie packed in more inventiveness than 10 standard flicks combined, and it did so with flair, panache, and class. The DVD offered excellent picture and audio plus a fairly strong roster of extras. Since this comes as the third DVD edition of The Fifth Element, recommendations become difficult. Here’s the easy one: if you don’t own any copy of the movie, go ahead and snag this one. It presents the flick with the highest quality along with some very strong supplements. Actually, I was surprised at how deep and interesting the extras were since they came with no participation from the director. I expected a mixed bag, but these dig pretty deeply into the production and give us a solid look at the film. If you own one of the prior releases, your choice will largely depend on your interest in those extras. If you don’t like them, there’s no reason to “upgrade” from the prior Superbit disc; picture and sound remain the same between those two. The visuals offer a minor step up from the original DVD, though I remain unconvinced it’s enough to warrant a repurchase; the 1997 version still looks pretty good. At least the inclusion of the supplements makes the upgrade more painless for those who have some interest in them. Bar none, this Ultimate Edition is the strongest DVD release of The Fifth Element.